There are certain things that simply make our lives better. The love of a family is essential in order to grow, prosper and to become greater. Whatever that “greater” is for someone, it is love from family that helps you achieve and become more. One realization I came upon during my second trip here (a two month stay) is that to some of the children here I was a part of their support system, and a part of their family. I never intended on living in Africa for longer than a year, being so serious about working at 25 or worrying about the well-being of a nine year old, but I guess God’s plan was different for me. I have been urged by my friends and mentors Stan and Nathan who recently visited that I should write more about some of the trials or struggles I have as a result of my role. They saw that what I write is not all that I do and that the situations of the children outside of school are sometimes more desperate than people understand. I usually keep that to myself, but I realize now that it’s definitely worth sharing. I recognized last summer that I needed to return here and to be serious about the care of these children. In order to make a lasting and strong difference in the community or school I needed to commit more time. Anyone can step in, buy gifts and then leave after a few months, but to truly be more for children I realized that I would have to do more than buying a pair of shoes or a new backpack. I needed to go further than saying “I love you” and actually express it in my actions no matter the circumstances or consequences. Because of my constant role here at the school I have known many families for a number of years now. In some cases that is a blessing and in some cases it is a curse. Some children are blessed with wonderful homes and others with horrible home lives. Many of our children are often being cared for by grandparents or relatives, which sometimes means they are seen as a burden. They are an extra mouth to feed and a costly investment of energy and money. In some cases there is abuse, both mental and physical and extreme neglect. This was the case with a special child in my heart, Catherine. From June to October I did my best to make it “profitable” and beneficial to her former caregivers to actually care for her. Without going into too many details, I recognized that no matter what I did for them, it wasn’t enough and her home would eventually be her downfall. After some time, many things that were intended to care for her were being withheld from her. She was so close to having everything she deserved, but the abuse and neglect persisted. So, she began to run away. The thought of going home was just too much. So, to the best of my ability I took action despite the potential backlash. Many people will question, out of a school of 100+ why her? How is it that I met 40 children years ago, but one of them calls me father? Do I feel I am stepping out of my role as a teacher? The truth is, I don’t know and I can’t really explain it. It’s in my heart and mind so I act. God blesses us with experiences to understand ourselves, our strengths, our limitations, and it is on us to act accordingly. I am absolutely stepping out of my role as a teacher but I don’t hesitate or have any reservations. Some people here have urged me to reconsider, be careful or tread lightly. They told me it’s dangerous for a white man to take on an active role in the community and especially to care for children. I am an outsider, an American and people may try to take advantage of me, they could make false accusations or try to hurt me simply because of my trying to help. In general, African men, especially young men, don’t care for children here, so I am in a role that people will not understand. The truth is, everyone with fears and worries are right. There are so many bad things that could happen, but that has never been a good enough reason in my mind not to help. If a child will be better off because of my caring, then I have a responsibility to do so. There are always things that could happen, but that is life, if I was careful or logical I wouldn’t be here. I wouldn’t be in Africa, working outside of a protected government NGO, taking non pay volunteer job after leaving a nice comfortable paying job. So when Catherine needed help I put myself into the middle of the problem and did my part to help her. I spent a night typing documents detailing all of her possessions (all of which I had given to her) and spent weeks reminding the priests of my special girl that needed their help too. Finally a family stepped up, and luckily for everyone involved it was a family I was familiar with. They came to me with their concerns, and I assured them that I would remain an active and ever present role in her life and they would not have to support her financially, just give her a loving home. So they took her from her old home, signed documents and gave her a new chance at life. For the first time since I have met her, I know Catherine is safe. She is in a loving home, with two older sisters and a brother Steven who is now her classmate at Stella Maris. I text the grandparents every day and Catherine still visits me every day during the holiday, but now she is accompanied by her sisters and brother. These days Catherine is flourishing like I always wished for her and she finally wears her beautiful smile without hesitation. In many ways my role is different now and different than I ever imagined it would be as a “volunteer” or “teacher” or any other title I have tried to label myself. The truth is none of those titles really fit. I had to forfeit those titles and step outside of them in order to do what I thought was best. As a family member, a father, or just someone who truly loves others, you have to make sacrifices. We are put in uncomfortable situations and have to face adversity for the ones we love. But God has prepared me for this, He made me stubborn, strong and persistent and I don’t think that is an accident. I have the support of the priests here, the village chairman, but what is most important is little Catherine’s support, which is expressed daily through her hugs and smiles. Every time Catherine squeezes my neck with a hug I know it is a reminder to trust my heart. Now because of her, I am trying to become that “greater” that only the love of family helps you achieve. Ugh… So I need to apologize for the delay in posting. We wrapped up testing at the school, hosted two of our founding members Stan and Nathan, my girl Catherine got sick with malaria, we have had a steady stream of guests, we started a couple new meal plans and on top of it all I’m not the best communicator anyways! But here goes my post about food. On this Thanksgiving I found myself thankful for so many things, most of all food. First off I am thankful for all the donors that have helped me get here to help with the food in Mailisita. Every donor has made it possible for me to be here and then plan for and put into action what we all know is necessary to help our children. In some cases it is as basic as food. Thanks to Ed and Barb Walters, one of our continued dreams of improving the food at our school has come true. The daily meals at Stella Maris have improved dramatically thanks to their generous donation to provide for more beans and twice a week Ugali (stiff porridge) and vegetables! Though it took a while to get started, we finally saw it come to fruition the last 3 weeks. One of our biggest concerns remains with the nutrition of our children and especially those entering puberty. They all require more protein, and our adolescent children require more iron and nutrients than ever before. After years of malnutrition at home, many are still under 60 lbs despite being 10 or 11 years old. Many children will come to school after taking just a cup of tea and a heavy meal the night before. Since their diet is almost exclusively carbohydrates they are not overly “hungry” but their bodies are lacking in nearly everything. I spent the first month of my trip trying to figure out the best way to economically and systematically provide better nutrition. I came up with a nice plan of how to implement more protein and vitamins and also how much it will cost/fundraise for it. Then our group from St. Joseph came and I explained my plan to Stan Taylor and the Walters family. Within moments they said “How much will it take to help the children eat better… O ok… well why don’t we just take care of the whole school for a year?” Now starting this past week our children are eating more beans and vegetables every day and will continue to all of next year! Not enough can be said about the generosity of Ed and Barb Walters and how much the children are enjoying the new food. Most of all, I look forward to seeing them grow taller and stronger in the coming year. 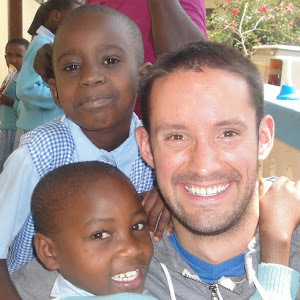 Adam and I also began a new tradition this year of properly celebrating Thanksgiving with the children in Africa! I am now excited to continue that tradition for the coming years of my work here. This Thanksgiving I didn’t eat any turkey, but I was able to spend the holiday with my African family feasting on Pilau courtesy of the St. Joseph’s Youth Group Souled Out! Souled Out raised money to sponsor a pilau day, and what better way to connect our communities than through a Thanksgiving feast. In a matter of two days we put together all the food needed and bought all the things necessary to cook the pilau for the children. I explained the whole idea of Thanksgiving and giving thanks, but I think they were all most thankful for the extra food they enjoyed! The final recent change happened for children from the whole community. I am always worried about trying to help more children as well as trying not to alienate ourselves in the community by not helping more families. Some families simply feel that we don’t help their children which is a fair feeling. So in the first step of trying to remedy this I started a weekend meal offered at the local church. With a lot of help from a new young priest Fr. Lucas Riziki and our manager Teddy I was able to buy all the pots needed to cook, cups needed to drink from and ingredients to cook porridge on the weekend. With a couple of very nice women volunteers we have been able to start a new way for our neediest children to find an extra meal on the weekends. It is a simple meal, just porridge, but in the past few weeks Fr. Lucas has said the number of children attending classes at the church has climbed from 80-90 to nearly 150! The children are all ages from 5 to 12 and many from Stella Maris as well as the other schools. It has been an incredible joy to take guests of the hotel on the weekends to see our children enjoying a meal that we have provided for them. With each week and whole lot of persistence we are slowly helping feed these children better. We have new meal plans at the school, more pilau then ever before and are now reaching the children around the community on the weekends. There is nothing better than meeting new children and getting the opportunity to share a meal and a smile. To let them know that even though they might not come to our school, we love them and care for them too.